, we invited some Bay Area shoppers to help us test Google Shopping Express. Today, we’re excited to make Google Shopping Express available to everyone living or working in our Bay Area delivery zones, from San Francisco to San Jose. This new service brings the speed of the web to the real world by helping you shop your favorite local stores online—in a single place—and get what you need delivered the same day. We are also launching a new mobile app, available for both Android and iOS, to bring you the convenience of Google Shopping Express even when you’re on-the-go. Whether you’ve run out of something essential or need to get a last-minute gift, you can shop your favorite stores all in one place, and get everything delivered in just a few hours. With Google Shopping Express, you can shop national, regional, and local stores, including American Eagle, Blue Bottle Coffee, Lucky, Office Depot, Palo Alto Toy & Sport, Photojojo, Raley’s Nob Hill Foods, Staples, Target, Toys“R”Us/Babies“R”Us, and Walgreens. And starting today, you can also fill your cart with items from DODOcase, Guitar Center, L’Occitane, REI, and Whole Foods Market. Stores price the items on Google Shopping Express the same as they do in-store, so you’ll pay the same amount for whatever you’re buying. You can add your retailer loyalty program number at checkout to take advantage of member prices. We’re working with many more local retailers and look forward to bringing them to Google Shopping Express soon. To make it easier for you to buy what you need on-the-go, we’re also launching the Google Shopping Express app for Android (v4.0+) and iOS (v6.0+). With the app, you can easily order your essentials, search for specific items, or browse different stores wherever you are—and have them delivered right to your door that day. You can download the app on the Google Play Store and the iOS App Store. With Google Shopping Express you can select a delivery window that’s convenient for you, starting in the morning and running as late as 9pm. To make this all work, our engineers put their heads together to figure out the most efficient way to get all the packages delivered across town in the delivery windows promised. And be sure to keep your eye out for our new hybrid fleet around town. Want to give it a try? For a limited time, you can get six months of free, unlimited same-day delivery when you sign up for our free membership. * To get started, visit google.com/shopexpress. We want to thank all of our early testers who shared their invaluable feedback to help us improve the service. We’re always looking to make Google Shopping Express better, so please continue to share your feedback with us. Let us know what you think and get updates by following Google Shopping Express on Google+. *Your account must be in good standing to remain eligible. Offer expires 12/31/2013. For complete terms and conditions see g.co/shopexpressterms. Say you have a list of errands as long as your arm, but the weather couldn’t be more perfect. Run errands or run in the park? 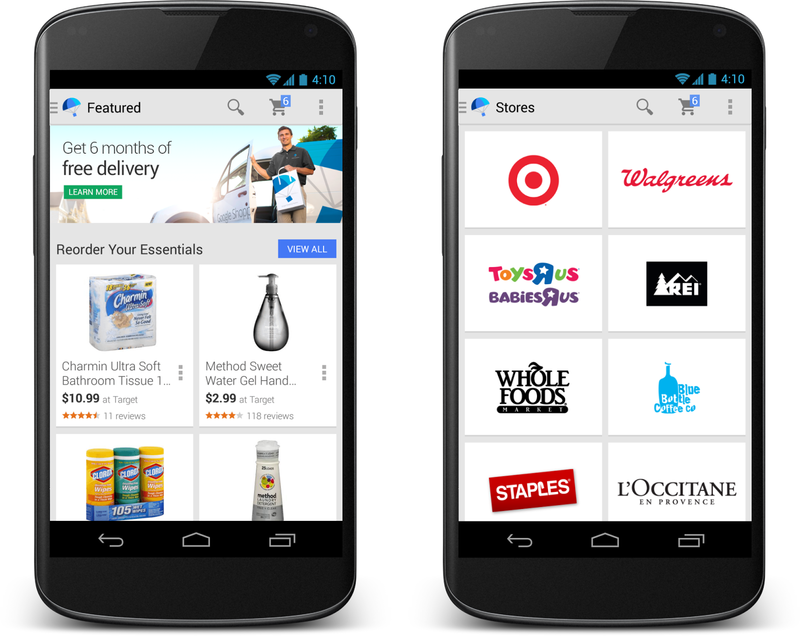 Google Shopping Express, a service that offers same-day delivery from local stores, lets you do both. 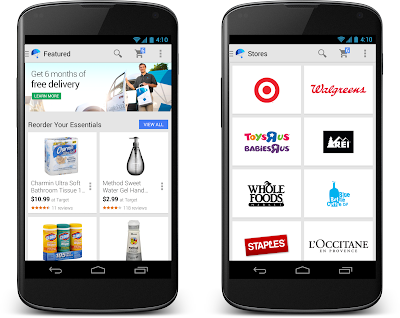 Earlier this year, we invited some Bay Area shoppers to help us test Google Shopping Express. Today, we’re excited to make Google Shopping Express available to everyone living or working in our Bay Area delivery zones, from San Francisco to San Jose. This new service brings the speed of the web to the real world by helping you shop your favorite local stores online—in a single place—and get what you need delivered the same day. We are also launching a new mobile app, available for both Android and iOS, to bring you the convenience of Google Shopping Express even when you’re on-the-go.